The New England Patriots got this season started off with an amazing performance on Monday Night Football against the division rival Miami Dolphins after reigning NFL MVP quarterback Tom Brady had a record-breaking performance with 517 yards and four touchdowns. There were a few question marks heading into this game for the Patriots as not many people knew how recently acquired Pro Bowl wide receiver Chad Ochocinco would fit into the mix and if he was the next Randy Moss for Tom Brady. Unfortunately, despite the record night for Tom Brady against the Miami Dolphins in Week 1, Chad Ochocinco had little impact in his debut with the New England Patriots. With just one catch for 15 yards, Ochocinco was basically invisible in his debut and might not have a bright future with his new team and quarterback. Ironically enough, just before the NFL regular season got underway for the Patriots, former wide receiver and future Hall-of-Famer Randy Moss said that he might return to the NFL. This wasn’t much of a surprise for NFL analysts or fans around the country to hear as the consensus was that Moss just didn’t get the offer he wanted before the season in order to comeback. The recent development was that Moss would only comeback if it was with the Patriots. This statement was something that I believe everyone already knew, but was nowhere near a reality as Patriots head coach Bill Belichick seemed like he had already cut his losses by trading the future Hall-of-Famer. 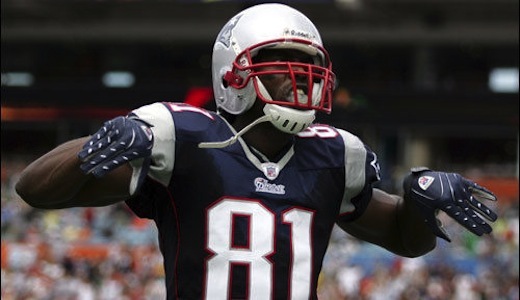 With that being said and with the team already acquiring six-time Pro Bowler Chad Ochocinco, Randy Moss returning to the New England Patriots would have been a stretch to say the least, but with reports of the Patriots possibly cutting Ochocinco before the season to save money the option to add Moss was still a possibility. The one person that was asked about the possible return of Randy Moss and whether or not he was embraces him on the team was superstar quarterback Tom Brady. Even though Brady was fine with and without Moss, the three-time Super Bowl champion and two-time NFL MVP said that he would welcome Moss if he did return to New England. This was probably music to the ears of Randy Moss as it opened of the possibility of a return to New England, but nothing really happened after the Brady said he would welcome him back and now Randy Moss has said that he is done after being asked if he would join the Patriots. That pretty much sums it up and might be the last words the media or the NFL hear from Randy Moss until he gets put into the NFL Hall of Fame.